One hundred years since Balfour's 'promise,' Palestinians insist that their rights in Palestine cannot be dismissed. A Palestinian refugee, no international journalist, whose parents and grandparents were forced out of their homes by the Zionist gangs, speaks about how the UK was involved in destroying Palestine. When I was a child growing up in a Gaza refugee camp, I looked forward to November 2. On that day, every year, thousands of students and camp residents would descend upon the main square of the camp, carrying Palestinian flags and placards, to denounce the Balfour Declaration. Truthfully, my giddiness then was motivated largely by the fact that schools would inevitably shut down and, following a brief but bloody confrontation with the Israeli army, I would go home early to the loving embrace of my mother, where I would eat a snack and watch cartoons. At the time, I had no idea who Balfour actually was, and how his "declaration" all those years ago had altered the destiny of my family and, by extension, my life and the lives of my children as well. All I knew was that he was a bad person and, because of his terrible deed, we subsisted in a refugee camp, encircled by a violent army and by an ever-expanding graveyard filled with "martyrs". Decades later, destiny would lead me to visit the Whittingehame Church, a small parish in which Arthur James Balfour is now buried. While my parents and grandparents are buried in a refugee camp, an ever-shrinking space under a perpetual siege and immeasurable hardship, Balfour's resting place is an oasis of peace and calmness. The empty meadow all around the church is large enough to host all the refugees in my camp. Finally, I became fully aware of why Balfour was a "bad person". Once Britain's Prime Minister, then the Foreign Secretary from late 1916, Balfour had pledged my homeland to another people. That promise was made on November 2, 1917, on behalf of the British government in the form of a letter sent to the leader of the Jewish community in Britain, Walter Rothschild. He concluded, "I should be grateful if you would bring this declaration to the knowledge of the Zionist Federation." Ironically, members of the British parliament have declared that the use of the term "Zionist" is both anti-Semitic and abusive. The British government remains unrepentant after all these years. It has yet to take any measure of moral responsibility, however symbolic, for what it has done to the Palestinians. Worse, it is now busy attempting to control the very language used by Palestinians to identify those who have deprived them of their land and freedom. But the truth is, not only was Rothschild a Zionist, Balfour was, too. Zionism, then, before it deservedly became a swearword, was a political notion that Europeans prided themselves to be associated with. In fact, just before he became Prime Minister, David Cameron declared, before the Conservative Friends of Israel meeting, that he, too, was a Zionist. To some extent, being a Zionist remains a rite of passage for some Western leaders. Balfour was hardly acting on his own. True, the Declaration bears his name, yet, in reality, he was a loyal agent of an empire with massive geopolitical designs, not only concerning Palestine alone, but with Palestine as part of a larger Arab landscape. Just a year earlier, another sinister document was introduced, albeit secretly. It was endorsed by another top British diplomat, Mark Sykes and, on behalf of France, by François Georges-Picot. The Russians were informed of the agreement, as they too had received a piece of the Ottoman cake. The document indicated that, once the Ottomans were soundly defeated, their territories, including Palestine, would be split among the prospective victorious parties. The Sykes-Picot Agreement, also known as the Asia Minor Agreement, was signed in secret 100 years ago, two years into World War I. It signified the brutal nature of colonial powers that rarely associated land and resources with people that lived upon the land and owned those resources. The centrepiece of the agreement was a map that was marked with straight lines by a china graph pencil. The map largely determined the fate of the Arabs, dividing them in accordance with various haphazard assumptions of tribal and sectarian lines. France would receive areas marked (a), which included: the region of south-eastern Turkey, northern Iraq - including Mosel, most of Syria and Lebanon. British-controlled areas were marked with the letter (b), which included: Jordan, southern Iraq, Haifa and Acre in Palestine and a coastal strip between the Mediterranean Sea and the River Jordan. Russia would be granted Istanbul, Armenia and the strategic Turkish Straits. The improvised map consisted not only of lines but also colours, along with language that attested to the fact that the two countries viewed the Arab region purely on materialistic terms, without paying the slightest attention to the possible repercussions of slicing up entire civilizations with a multifarious history of co-operation and conflict. The agreement read, partly: "… in the blue area France, and in the red area Great Britain, shall be allowed to establish such direct or indirect administration or control as they desire and as they may think fit to arrange with the Arab state or confederation of Arab states." The brown area, however, was designated as an international administration, the nature of which was to be decided upon after further consultation among Britain, France and Russia. 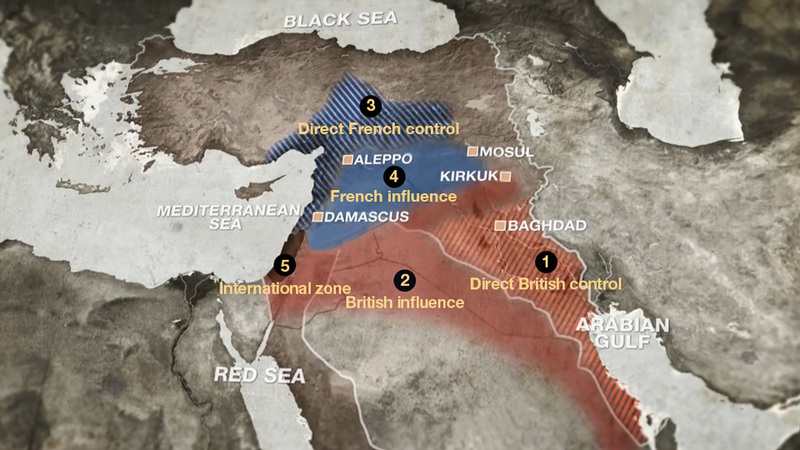 The Sykes-Picot negotiations finished in March 1916 and were official, although secretly signed on May 19, 1916. World War I concluded on November 11, 1918, after which the division of the Ottoman Empire began in earnest. British and French mandates were extended over divided Arab entities, while Palestine was granted to the Zionist movement a year later, when Balfour conveyed the British government's promise, sealing the fate of Palestine to live in perpetual war and turmoil. The idea of Western "peacemakers" and "honest-brokers", who are very much a party in every Middle Eastern conflict, is not new. British betrayal of Arab aspirations goes back many decades. They used the Arabs as pawns in their Great Game against other colonial contenders, only to betray them later on, while still casting themselves as friends bearing gifts. Nowhere else was this hypocrisy on full display as was in the case of Palestine. Starting with the first wave of Zionist Jewish migration to Palestine in 1882, European countries helped to facilitate the movement of illegal settlers and resources, where the establishment of many colonies, large and small, was afoot. So when Balfour sent his letter to Rothschild, the idea of a Jewish homeland in Palestine was very much plausible. Still, many supercilious promises were being made to the Arabs during the Great War years, as self-imposed Arab leadership sided with the British in their war against the Ottoman Empire. Arabs were promised instant independence, including that of the Palestinians. The understanding among Arab leaders was that Article 22 of the Covenant of the League of Nations was to apply to Arab provinces that were ruled by the Ottomans. Arabs were told that they were to be respected as "a sacred trust of civilization", and their communities were to be recognised as "independent nations". Palestinians wanted to believe that they were also included in that civilization sacredness, and were deserving of independence, too. Their conduct in support of the Pan-Arab Congress, as voting delegates in July 1919, which elected Faisal as a King of a state comprising Palestine, Lebanon, Transjordan and Syria, and their continued support of Sharif Hussein of Mecca, were all expressions of their desire for the long-coveted sovereignty. When the intentions of the British and their rapport with the Zionists became too apparent, Palestinians rebelled, a rebellion that has never ceased, 99 years later, for the horrific consequences of British colonialism and the eventual complete Zionist takeover of Palestine are still felt after all these years. Paltry attempts to pacify Palestinian anger were to no avail, especially after the League of Nations Council in July 1922 approved the terms of the British Mandate over Palestine - which was originally granted to Britain in April 1920 - without consulting the Palestinians at all, who would disappear from the British and international radar, only to reappear as negligible rioters, troublemakers, and obstacles to the joint British-Zionist colonial concoctions. Despite occasional assurances to the contrary, the British intention of ensuring the establishment of an exclusively Jewish state in Palestine was becoming clearer with time. The Balfour Declaration was hardly an aberration, but had, indeed, set the stage for the full-scale ethnic cleansing that followed, three decades later. "The Mandate, as a whole, was seen by the Palestinians as an Anglo-Zionist condominium and its terms as instrument for the implementation of the Zionist programme; it had been imposed on them by force, and they considered it to be both morally and legally invalid. The Palestinians constituted the vast majority of the population and owned the bulk of the land. Inevitably, the ensuing struggle centreed on this status quo. The British and the Zionists were determined to subvert and revolutionise it, the Palestinians to defend and preserve it." In fact, that history remains in constant replay: The Zionists claimed Palestine and renamed it "Israel"; the British continue to support them, although never ceasing to pay lip service to the Arabs; the Palestinian people remain a nation that is geographically fragmented between refugee camps, in the diaspora, militarily occupied, or treated as second-class citizens in a country upon which their ancestors dwelt since time immemorial. While Balfour cannot be blamed for all the misfortunes that have befallen Palestinians since he communicated his brief but infamous letter, the notion that his "promise" embodied - that of complete disregard of the aspirations of the Palestinian Arab people - is handed from one generation of British diplomats to the next, the same way that Palestinian resistance to colonialism is also spread across generations. In his essay in the Al-Ahram Weekly, entitled "Truth and Reconciliation", the late Professor Edward Said wrote: "Neither the Balfour Declaration nor the Mandate ever specifically concede that Palestinians had political, as opposed to civil and religious, rights in Palestine. The idea of inequality between Jews and Arabs was, therefore, built into British - and, subsequently, Israeli and US - policy from the start." That inequality continues, thus the perpetuation of the conflict. What the British, the early Zionists, the Americans and subsequent Israeli governments failed to understand, and continue to ignore at their own peril, is that there can be no peace without justice and equality in Palestine; and that Palestinians will continue to resist, as long as the reasons that inspired their rebellion nearly a century ago, remain in place. Ninety-nine years later, the British government is yet to possess the moral courage to take responsibility for what their government has done to the Palestinian people. Ninety-nine years later, Palestinians insist that their rights in Palestine cannot be dismissed, neither by Balfour, nor by his modern peers in "Her Majesty's Government." The article was published on Al Jazeera on 2 November 2016.